Please contact the synagogue office for other donation opportunities (631-368-6474). Please note: Your tax deductible contribution will be billed to your synagogue account. 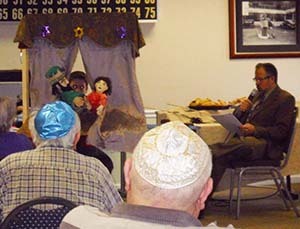 Rabbi Silverman, with the puppeteer help of Evan Keiser, presented a Purim puppet show at Atria Assisted Living in East Northport, on February 22. Residents, both Jewish and non-Jewish, were delighted and entranced. Registration is required. Fee: $5 per child, $8 per adult.